I have to go to the maternity day clinic tomorrow so I thought I’d post the rest of the baby stuff that I made, just in case they make me stay. I have borderline hypertension, nothing serious, they just want to know if it fluctuates wildly in a single day or if it’s more of a week by week thing. It’s been perfect for the last 6-8 weeks, but was borderline on Friday and when I first saw the doctor 18 weeks ago so they want to know if it could have been high on days that I wasn’t at the clinic. 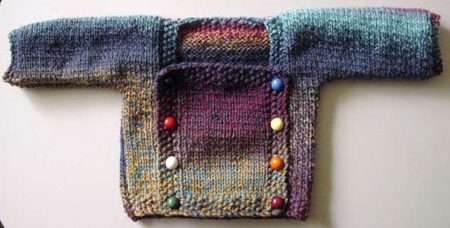 I’ll be taking some knitting of course (I hope they let me knit while attached to all those gadgets), and I’ll be making some ballband washcloths. I’ll show the projects roughly in the order that I finished them. Because I don’t want to spend 10 hours writing a post like I did with the toys, I’ll link each project to my ravelry page so that you can see my notes on any changes that I made, which yarns I used etc. 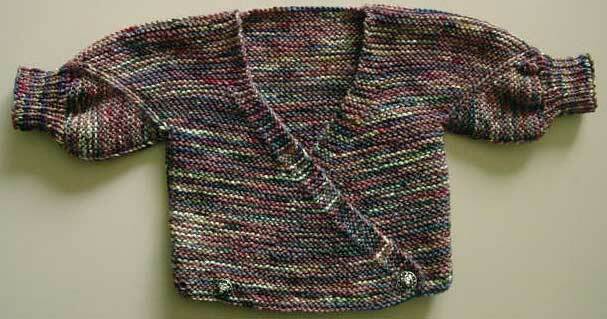 Presto Chango, a free online pattern. The original has very pretty lace panels on the front but I left the lace off because I didn’t think it would work well with such a colourful yarn. 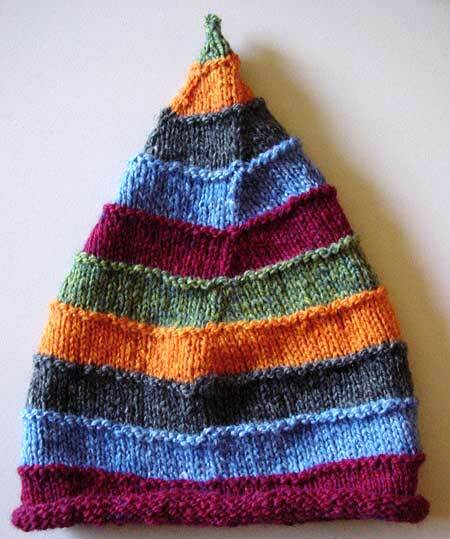 Knut Hats, a free pattern on Knitting-and.com. 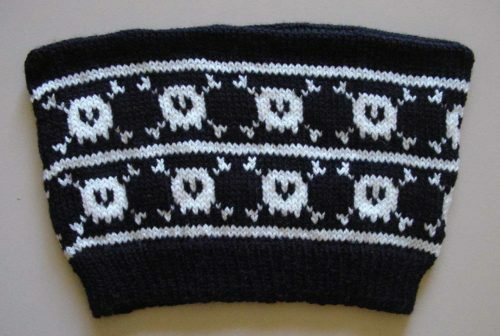 Owl Baby Vest, a free Ravelry download. 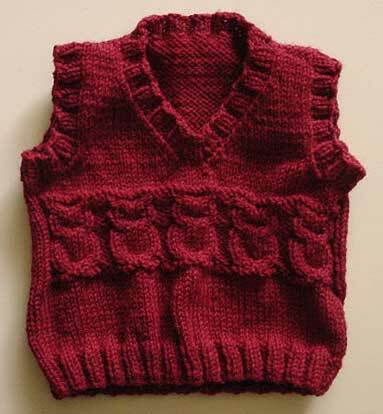 I made a lot of size modifications to this vest so that it would fit baby-in-progress during the cold weather. 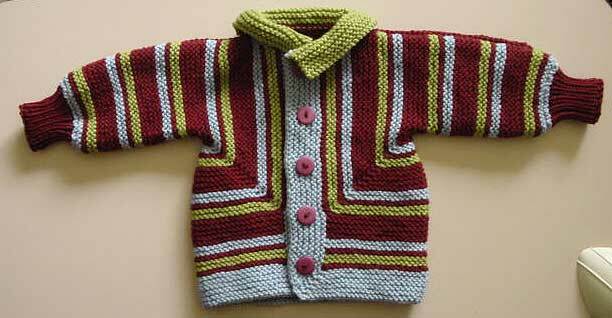 and that’s it for all the baby knitting so far! Apologies for my continuing absence. I’ve been napping a lot in between crafting, visiting the midwives clinic and having all those fun (not) tests that are inflicted upon pregnant women. Speaking of crafting, since that’s what you’re here for, I thought I’d write a few posts about what I have been making for my 15 year old daughter and son-in-progress. I’ll post all out of order and start with the things I have made for my daughter. First of all is the Texture Shawl Collar Jacket from Patons Australia, booklet #1264, Inca Fashion Knits. I actually received the pattern as a freebee from Stitches magazine so I don’t have the whole booklet. 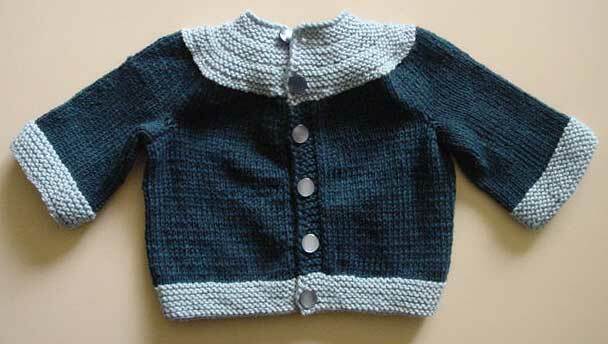 I really enjoyed knitting this jacket. 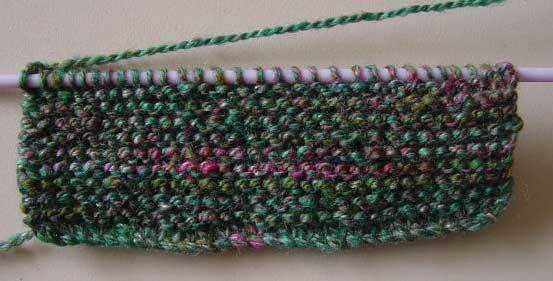 The stitch pattern is easy to remember but changes enough to keep it interesting and it works up really fast. I really like the Patons pattern books as Brittany likes many of the designs and many them are written in sizes small enough for her. 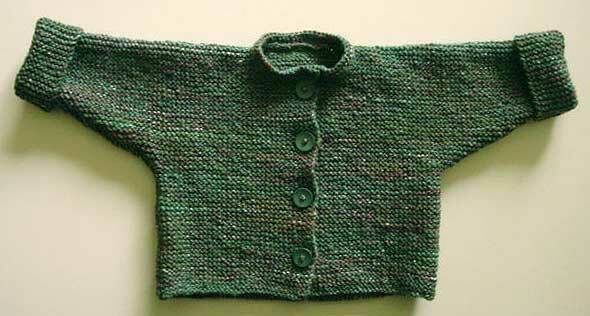 I knit the small size and made the whole thing 4.5cm shorter because Brit is so tiny (for our family, lol) and used 2.5 balls of yarn less because of the shortening. 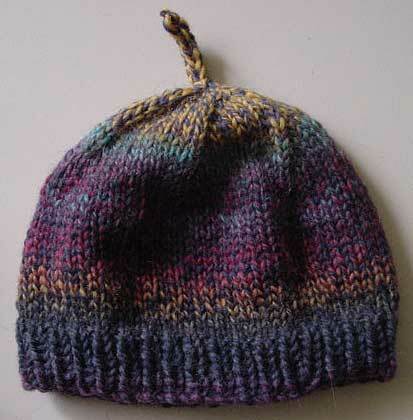 I would keep this particular yarn for special garments. It’s loosely spun so it wouldn’t stand up to a lot of wear and tear, but for a special garment I find it really nice and would definitely use it again. The buttons are (I assume lasercut) coconut shell which I bought at Spotlight for $5 each. Actually, the hardest part of this jacket was finding the buttons! 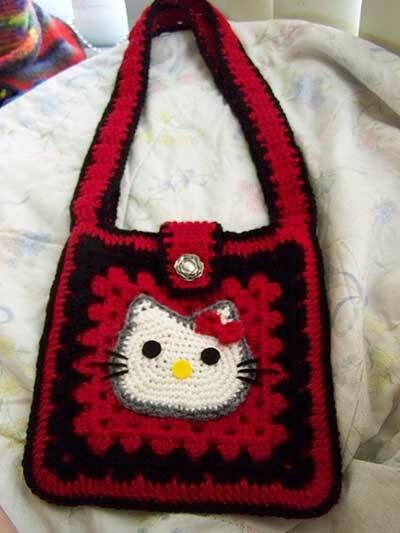 Next up is a Hello Kitty Mini-Tote that I crocheted for Brittany’s birthday last week. I used the face pattern from a backpack and made two granny squares for the purse section. 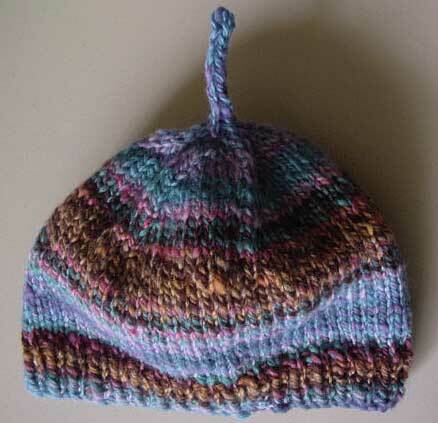 It’s made from Cleckheaton Country 8 ply (dk weight) wool and lined with some red cotton. The eyes are felt stuck on with washable craft glue. I’ve been crafting from patterns a lot lately and it was nice to make up a pattern on the fly for a change. Speaking of things that are different, this is Gary the evil sock monkey. Gary is a basic sock monkey with quilted wings. To make the wings I drew a basic wing shape on a piece of paper. Then I cut 2 out of black homespun cotton and one from a medium weight quilt batting. 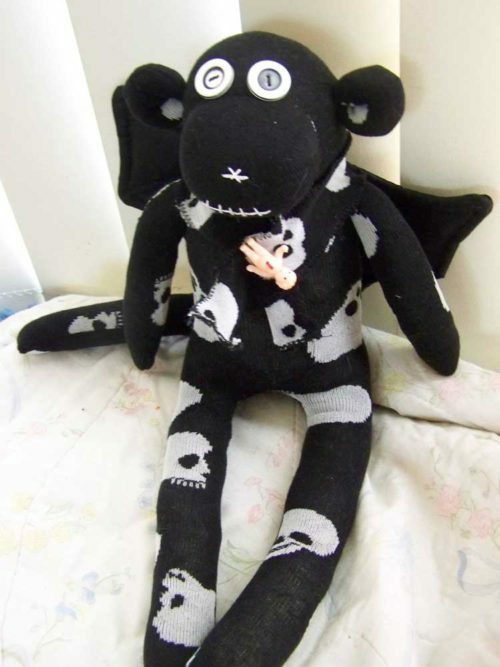 Of course all evil flying sock monkeys need a best friend, so when I saw this pattern featured on the Craft: magazine blog, I had to make one! That’s all of my crafting for teens at the moment. Tomorrow: baby blankets!